Vancouver, B.C. - Corvus Gold Inc. (“Corvus” or the “Company”) - (TSX: KOR, OTCQX: CORVF) announces results from the final six holes of its 2014 Phase I drill program and the first hole of its Phase II drill campaign at the North Bullfrog Project in Nevada. Â Holes NB-14-393 through NB-14-398 extended the main Josh Vein structural zone of the Yellowjacket deposit an additional 200 metres to the north and defined a new parallel target zone to the west of the main Josh Vein called NW10, which is similar to the recently discovered Rhyolite Zone to the East (NR14-17, September 4, 2014). 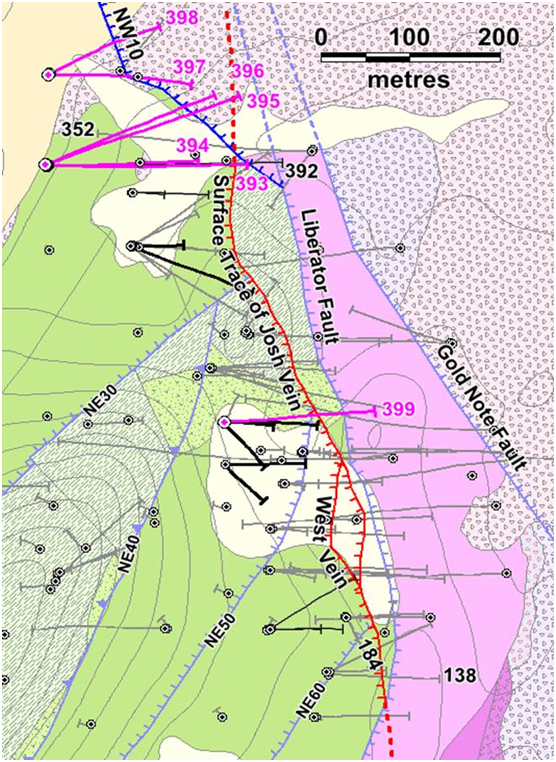 Â This new discovery has broadened the total width of the Yellowjacket structural zone in the north and has provided critical data in defining a new high-grade shoot target at the intersection of the NW10, Josh Vein and Rhyolite zones.Â In addition, the new NW 10 zone has now extended vein/stockwork mineralization to over 250 metres in depth, thereby expanding the overall potential of the system. The initial hole of the Phase II program intersected a high-grade internal shoot in the main Josh Vein target that returned encouraging results and key data that warrants follow-up drilling.Â This shoot target is developing within an essentially undrilled area of the Yellowjacket deposit (“gap area”) immediately north of the intersection of the West Vein and the Josh Vein (Figure 1). 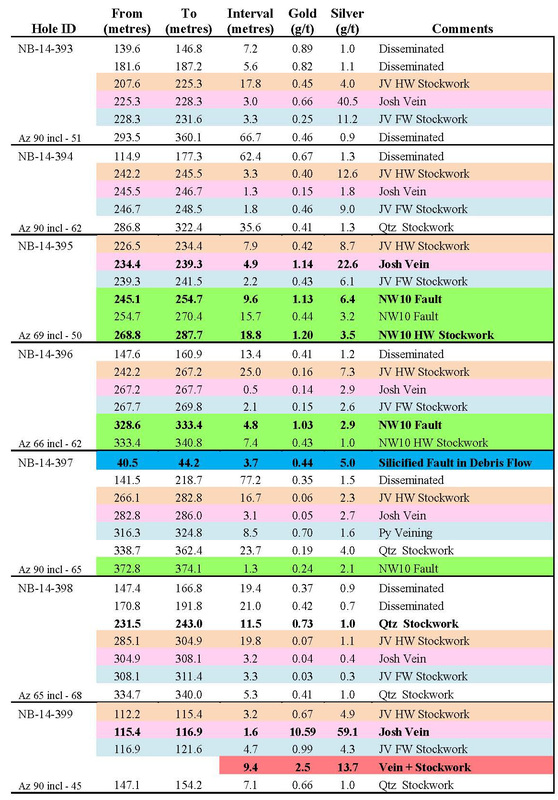 Â Hole NB-14-399 tested the uppermost part of the shoot target, and returned 9.4 m @ 2.5 g/t gold & 13.7 g/t silver including 1.6 m @ 10.6 g/t gold and 59 g/t silver. Follow-up holes below hole NB-14-399 are intersecting broad zones of vein and stockwork material at depth (results pending).Â In many epithermal vein deposits like Yellowjacket, internal zones of very high-grade can develop in shoot type features, which is the target in this new area of the system.Â Three additional holes have been completed in the target with at least two more planed. Hole NB-14-399 is the first hole to be returned in a series of holes drilled to fill a gap in the previous drilling immediately north of the intersection of the West Vein and the Josh Vein (Figure 1). Â Results have confirmed that the strike of the main vein has changed to north-northwest at this location, which is believed to be important to the initial development of a bonanza grade shoot target.Â Four holes have currently been completed on the “Gap Shoot” target with 2 more planned to initially test an unexplored area 200 metres long, to a depth of 250 metres.Â Detailed geologic work conducted over the past 6 months using oriented core has now began to define structural zones within the overall deposit with the potential to host areas of bonanza-grade mineralization that could significantly impact the overall grade of a future estimated resource of the Yellowjacket deposit. Both holes NB-14-395 and 396 encountered significant mineralization along the NW10 Fault, a structure that was not previously known to be mineralized. Â In hole NB-14-395 the Josh Vein is less than 6 metres away from the NW10 fault, potentially moving to the new western and eastern structural zones. Â These new structures, together with the Rhyolite Zone (NB-14-392 with 11.3 metres @ 3.3 g/t gold and 4 g/t silver and NB-13-352 with 2.4m @ 7.6 g/t gold and 6.9 g/t silver (NR14-17, Sept 4, 2014) indicate that the northern end of the Yellowjacket deposit is emerging as an open ended series of vein structures with multiple exploration targets for further potential high-grade vein discoveries. In addition, Hole NB-14-397 intersected a new silicified fault zone that returned 0.44 g/t gold and 5 g/t silver over 3.7 metres in rock units previously thought to have been deposited after the main Yellowjacket deposit formed.Â This exciting new discovery now opens up numerous new exploration targets to the north and throughout the District to the south in this unit. *The veining and stockwork veining have been defined by geological observation of the percentage of veining in the interval, e.g. significant concentrations of veining in the immediate hangingwall and footwall of the main structure. Â Several intersections are below the assumed economic cutoff of 0.3 g/t gold and are reported simply to indicate the tenor of the mineralization along the Josh Vein Fault. Figure 1: Location of 2014 drill holes at Yellowjacket. Â Assays from the holes indicated in fuscia are reported in this release. Â Black traces are from holes with pending assays. Â Holes are labeled with last 3 digits of name. Â The areas with pink and purple triangular patterns are debris flow sediments that were thought to be post-Yellowjacket mineral cover. Â However, in hole NB-14-397 these sediments are mineralized (Table 1), opening new exploration possibilities in these rocks. Corvus is currently utilizing two core drills focusing on expanding the Yellowjacket estimated resource along strike, internally and at depth.Â The Phase II program will continue through November and, following the return of all results from the program, the Company intends to calculate a new estimated resource in the first quarter of 2015.Â This estimated resource will form the basis of an initial Preliminary Economic Assessment (PEA) that will incorporate the new information from the Yellowjacket discovery. Â The PEA is scheduled to be completed in Q2 of 2015.Â In addition, Corvus is engaged in detailed metallurgical studies of the new high-grade mineralization which have provided very encouraging initial results.Â The North Bullfrog project is also being advanced on a number of exploration fronts as well as project characterization work ahead of permitting. Corvus controls 100% of its North Bullfrog Project, which covers approximately 68 kmÂ� in southern Nevada.Â The property package is made up of a number of private mineral leases of patented federal mining claims and 758 federal unpatented mining claims.Â The project has excellent infrastructure, being adjacent to a major highway and power corridor as well as a large water right. Based upon a USD 1300 gold price and a silver to gold price ratio of 59:1, the North Bullfrog project currently has estimated mineral resources defined in six deposits: the structurally controlled Yellowjacket milling deposit and the oxidized disseminated heap leach Sierra Blanca, Jolly Jane, Air Track West, Connection and Mayflower deposits.Â The Yellowjacket vein-style deposit has an Indicated Mineral Resource of 3.69 Mt at an average grade of 1.03 g/t gold and 5.52 g/t silver for 122,000 contained ounces of gold and 654,000 ounces of silver and an Inferred Mineral Resource of 18.40 Mt with an average grade of 0.94 g/t gold and 6.16 g/t silver for 555,000 contained ounces of gold and 3.64M ounces of silver, both at a 0.29 g/t gold cutoff. Jeffrey A. Pontius (CPG 11044), a qualified person as defined by National Instrument 43-101, has supervised the preparation of the scientific and technical information that forms the basis for this news release and has approved the disclosure herein.Â Mr. Pontius is not independent of Corvus, as he is the CEO and holds common shares and incentive stock options. The work program at North Bullfrog was designed and supervised by Russell Myers (CPG 11433), President of Corvus, and Mark Reischman, Corvus Nevada Exploration Manager, who are responsible for all aspects of the work, including the quality control/quality assurance program.Â On-site personnel at the project log and track all samples prior to sealing and shipping.Â Quality control is monitored by the insertion of blind certified standard reference materials and blanks into each sample shipment.Â All resource sample shipments are sealed and shipped to ALS Minerals in Reno, Nevada, for preparation and then on to ALS Minerals in Reno, Nevada, or Vancouver, B.C., for assaying.Â ALS Minerals’s quality system complies with the requirements for the International Standards ISO 9001:2000 and ISO 17025:1999.Â Analytical accuracy and precision are monitored by the analysis of reagent blanks, reference material and replicate samples.Â Finally, representative blind duplicate samples are forwarded to ALS Chemex and an ISO compliant third party laboratory for additional quality control. Corvus Gold Inc. is a North American gold exploration company, which is focused on advancing its 100% controlled Nevada, North Bullfrog project towards a potential development decision.Â In addition, the Company controls a number of other North American exploration properties representing a spectrum of gold, silver and copper projects. This press release contains forward-looking statements and forward-looking information (collectively, “forward-looking statements”) within the meaning of applicable Canadian and US securities legislation.Â All statements, other than statements of historical fact, included herein including, without limitation, statements regarding the anticipated content, commencement and cost of exploration programs, anticipated exploration program results, the discovery and delineation of mineral deposits/resources/reserves, the potential to develop multiple Yellowjacket style high-grade zones, the potential to discover additional high grade veins or additional deposits, the potential to outline a potentially large area which could host significantly higher grades and which might add considerably to the overall Yellowjacket resource and deposit; the potential to expand the existing estimated resource at the North Bullfrog project, the potential for the discovery of a bonanza grade shoot target at Yellowjacket; the potential for rock units previously thought to have been deposited after the main Yellowjacket deposit formed to host mineralization and thereby open up numerous new exploration targets to the north and throughout the District to the south in this unit; the potential for gold mineralization to occur in different host rocks thereby significantly adding to the potential of the overall District; the timing and completion of the Phase II drill program, the timing and completion of the updated resource estimate and PEA for the North Bullfrog project, the potential for any mining or production at North Bullfrog, the potential for the Company to secure or receive any royalties in the future, business and financing plans and business trends, are forward-looking statements.Â Information concerning mineral resource estimates may be deemed to be forward-looking statements in that it reflects a prediction of the mineralization that would be encountered if a mineral deposit were developed and mined.Â Although the Company believes that such statements are reasonable, it can give no assurance that such expectations will prove to be correct.Â Forward-looking statements are typically identified by words such as: believe, expect, anticipate, intend, estimate, postulate and similar expressions, or are those, which, by their nature, refer to future events.Â The Company cautions investors that any forward-looking statements by the Company are not guarantees of future results or performance, and that actual results may differ materially from those in forward looking statements as a result of various factors, including, but not limited to, variations in the nature, quality and quantity of any mineral deposits that may be located, variations in the market price of any mineral products the Company may produce or plan to produce, the Company's inability to obtain any necessary permits, consents or authorizations required for its activities, the Company's inability to produce minerals from its properties successfully or profitably, to continue its projected growth, to raise the necessary capital or to be fully able to implement its business strategies, and other risks and uncertainties disclosed in the Company’s 2013 Annual Information Form and latest interim Management Discussion and Analysis filed with certain securities commissions in Canada and the Company’s most recent filings with the United States Securities and Exchange Commission (the “SEC”).Â All of the Company’s Canadian public disclosure filings in Canada may be accessed via www.sedar.com and filings with the SEC may be accessed via www.sec.gov and readers are urged to review these materials, including the technical reports filed with respect to the Company’s mineral properties. United States investors are cautioned that the requirements and terminology of NI 43-101 and the CIM Standards differ significantly from the requirements and terminology of the SEC set forth in the SEC’s Industry Guide 7 (“SEC Industry Guide 7”).Â Accordingly, the Company’s disclosures regarding mineralization may not be comparable to similar information disclosed by companies subject to SEC Industry Guide 7.Â Without limiting the foregoing, while the terms “mineral resources”, “inferred mineral resources”, “indicated mineral resources” and “measured mineral resources” are recognized and required by NI 43-101 and the CIM Standards, they are not recognized by the SEC and are not permitted to be used in documents filed with the SEC by companies subject to SEC Industry Guide 7.Â Mineral resources which are not mineral reserves do not have demonstrated economic viability, and US investors are cautioned not to assume that all or any part of a mineral resource will ever be converted into reserves.Â Further, inferred resources have a great amount of uncertainty as to their existence and as to whether they can be mined legally or economically.Â It cannot be assumed that all or any part of the inferred resources will ever be upgraded to a higher resource category.Â Under Canadian rules, estimates of inferred mineral resources may not form the basis of a feasibility study or prefeasibility study, except in rare cases.Â The SEC normally only permits issuers to report mineralization that does not constitute SEC Industry Guide 7 compliant “reserves” as in-place tonnage and grade without reference to unit amounts.Â The term “contained ounces” is not permitted under the rules of SEC Industry Guide 7.Â In addition, the NI 43-101 and CIM Standards definition of a “reserve” differs from the definition in SEC Industry Guide 7.Â In SEC Industry Guide 7, a mineral reserve is defined as a part of a mineral deposit which could be economically and legally extracted or produced at the time the mineral reserve determination is made, and a “final” or “bankable” feasibility study is required to report reserves, the three-year historical price is used in any reserve or cash flow analysis of designated reserves and the primary environmental analysis or report must be filed with the appropriate governmental authority. U.S. investors are urged to consider closely the disclosure in our latest reports and registration statements filed with the SEC. You can review and obtain copies of these filings at http://www.sec.gov/edgar.shtml. U.S. Investors are cautioned not to assume that any defined resource will ever be converted into SEC Industry Guide 7 compliant reserves.